You are here: HomenextPeoplenextLocal folknextAubrey Budd: local artist? 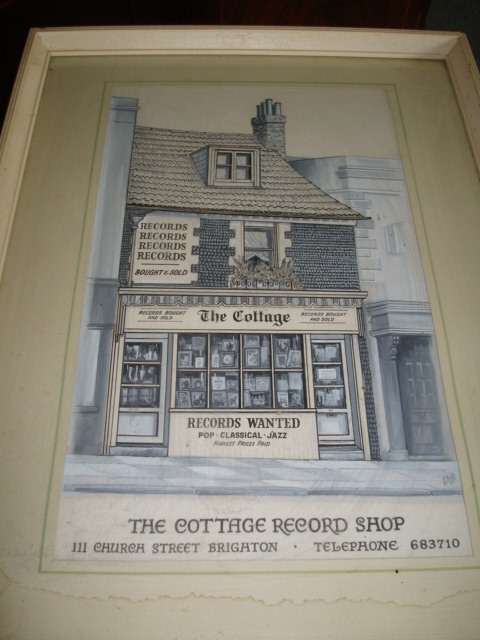 I recently acquired an original watercolour painting of The Cottage record shop in Brighton which I understand closed in the 1980s. The painting is a wonderful watercolour painted by an Aubrey Budd, but I have been unable to find anything about this super artist – can anyone help? I hope that if Aubrey is still alive – he would be in his eighties, and when I last saw him around ten years ago, he was recovering from illness. I hope he will forgive me for saying that he was something of an eccentric recluse. He was indeed a superb artist. I am the proud owner of a couple of small ‘chocolate box’ type paintings that he did for me in 1976. He was as adept with oils as with water colours, and his calligraphy, which, he proudly told me, he always did with a brush, never a pen, was beyond belief. I wish I had an example of that. Aubrey, if you are still around, thank you. Aubrey, who resided in Viaduct Road during the eighties, lived very frugally, but had everything that he considered important. He had a collection of classical records, amongst which were operas sung by various artists, ranging from Jussi Borling, Gigli, and Caruso, to Di Stefano and Lanza. He liked sopranos Vitoria de Los Angeles and Maria Callas. Wagner was also included in his collection. Another interest of his was steam engines. In the eighties, he was the proud owner of a fine working model of The Mallard. In his painting, he was extremely diligent. Fastidious is understating his attitude. As I have said, he was a beautiful writer, a discipline that he thoroughly enjoyed, though I believe he liked even more working on miniature paintings. As an example of his diversity, I once saw him working on an old seascape, an oil painting, which a client had asked him to prepare. All of these he returned to enjoy, after the death of his beloved mother, an event which caused him to temporarily go blind. Aubrey had a sister. I could not say whether she was older or younger. I never met her, or his mother. I only know of them through conversations with Aubrey. He also told me that his father was an acquaintance of Hillaire Belloc. Outside an auctioned house on Viaduct Road, I came across an old scrapbook. Fascinated, I leafed through it only to discover that it was the work of Aubrey Budd, c.1974. At the time he was obsessed with religious philosophy and the meaning of life. It makes for an engaging document of the man. Enzo: That is fascinating. He was indeed obsessive. At around that time (1974) on a lowly scale, we had many philosophical discussions. Existentialism was a favourite – of mine anyway since it was the only one I knew anything about. He quoted Nietzsche in discussions about Wagner, and it seems that he had also read Kant. Highly eccentric, as I have said, but a wonderful artist. I assume from comments here that Aubrey is deceased. I would just like to add that despite his ‘eccentricity’, he served in a Sussex Regiment during the war, was wounded, and made his escape from the front back through enemy lines. He was, he told me, like many serving with him, totally unsuited to army life. When, after being wounded, he asked permission to return from the front, his superior officer told him the enemy was between him and safety, but if he wished to take his chances… Aubrey made it. I do not know on which Front he served, or whether the limited use of one arm was as a result of a war wound. I just listened. I hope I was of some help to him. R.I.P. old friend. Sorry to enter this correspondence late. Aubrey is still very much alive: I saw him today. I’m going to write to him to check whether he’s happy to be contacted or at least written about. More later. Thanks for that uplifting news Catherine. I look forward to your next post.The notebook is still in my private collection. I am v glad I saved it from the rubbish collection it was amongst. How nice to know that Aubrey Budd is still with us. He sold me several of his paintings and some were exchanged for work on his collection of decommissioned rifles and hand guns. Does he still wear that old hat? I am most delighted that Aubrey is well, and in good hands. I am astonished to learn that he had an interest in weapons. I am sure I must at some time told him that I was once a first class marksman with Bren Gun and Rifle, but I do not recall him mention his interest. However, he was, I am sure, interested in many subjects that he did not discuss with me. As the person who helped him move out will know, apart from the Mallard model, record collection, and artist’s paraphernalia, Aubrey also had a large number of old school type blackboards and easels upstairs. He MAY have used them. I did not ask. I hope he has many healthy years ahead. Aubrey, you once asked me the following question: If a tree falls in an undiscovered forest, and no-one is there to see or hear it, did it really happen? I am still not sure. But you made me think – and smile. Joe – I’m sure Aubrey will forgive me for butting in… we don’t have to see or hear it to know that it happened. We can dig up the coal later. Aubrey is indeed an amazing man-I’ve had wonderful chats with him. Catherine. Aubrey would like that answer, but would probably suggest that you first discover the forest. Linda, you must be as eccentric as Aubrey. Joe – we always smiled. I am now offering the picture for sale if there is anyone interested – email me on camelot48_uk@yahoo.com or telephone 01323 509720. When I moved into the Eatwell Cafe in Viaduct Road, 1970/71, Aubrey made the sign ‘REID’S RESTAURANT’ for me, and helped me attach it. He also helped me attempt to promote the place with a poster and leaflets saying, “Luncheon, Sweet and a Cup of Tea, All for less than 50p”. Reading this page is wonderful. Aubrey died just a few weeks ago and I was lucky enough to be his friend for the last three years. Despite our 60 yr age gap we talked about life, religion, opera, the war, philosophy and everything in between! He was a total legend. I will cherish the drawings he did for me and all the things he taught me. Dying without family, his funeral will be a quiet affair but if you see this and want to attend or know anyone who knew him, it will be on the 14th May at Hove Cemetry Chapel at 10am. RIP King of Elves – Aubrey Budd – Artist, War Veteran and all round brilliant human being and friend. I was lucky enough to get to know Aubrey during his last few months of life – he was still drawing until his death. He was also such an interesting man to talk to and never seemed unhappy, he lived in the same nursing home that my dear husband now lives in. If it hadn’t been for my husband’s illness and also living there I would never have had the pleasure of knowing such a lovely man as Aubrey. R.I.P Aubrey – my son Paul, grandson Zak and myself will never forget you. Just come across the painting by this wonderful artist for which I had no offers, so thought I would try again – give me call 01323 509720 if interested. Only the really good people in this world who made an impact continue to get discussed in such a positive way after they have departed. Well done Aubrey! Farewell my eccentric old friend. Thanks for your help. I was working in a charity shop when I first met Aubrey and hit it off straightaway through a love of books. He lived in the next street and I would often stop and talk. He was a minefield of information and told me about his close shave with death in the war which he was lucky to survive. He was a true character in his trilby hat and often showed me his magnificent artwork. A genuinely nice man, always cheerful. Sad to hear of his passing.